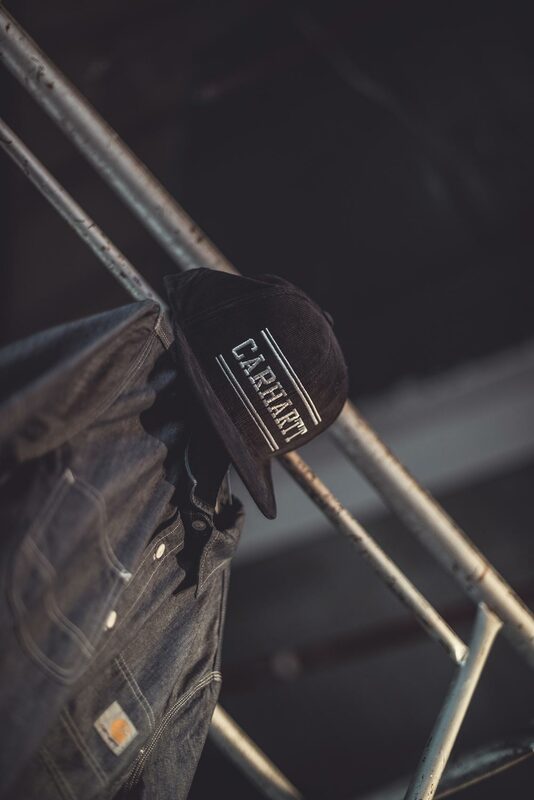 Carhartt is a U.S. based company founded in 1889 that focuses on industrial work clothes. They are known for their durable and longlasting apparel, fit for heavy duty activity. The brand became an anti-fashion icon in the 70’s and 80’s with the grunge and punk scenes and later with the Hip Hop world and remains popular with rappers to this day. This led to the WIP line (Work in Progress), making Carhartt fashionable in Europe and Asia. WIP line is a streetwear version of the brand which was launched in the 80’s, mostly a hit today amongst the urban lifestyle and subcultures. 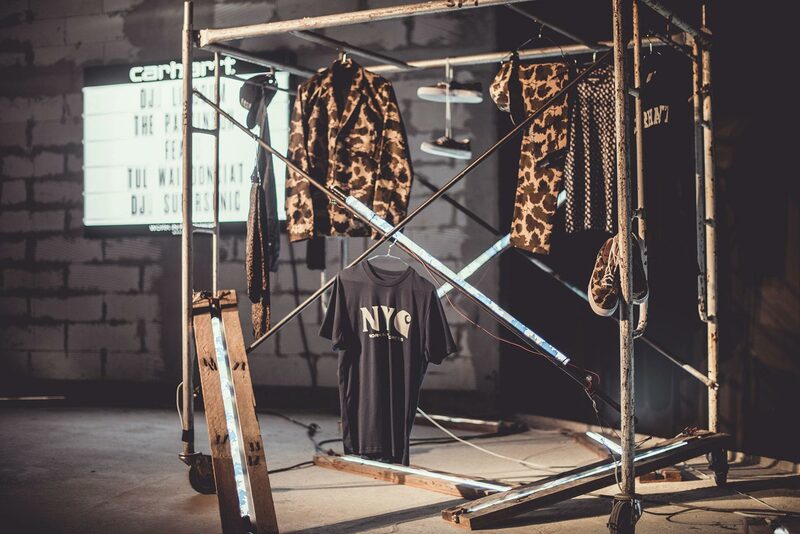 It is a streetwear brand that often collaborates with other iconic street brands such as The Bathing Ape. The WIP line also supports affinity groups such as artists, musicians and skateboarders. They are marketted comparable to brands such as Stüssy and Volcom. 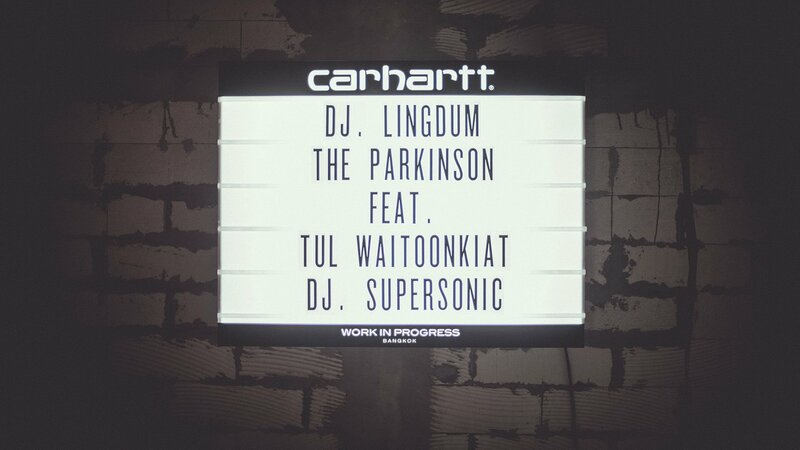 We were honored to organise and manage Carhartt’s first WIP launch event in Thailand at Groove/Central World. 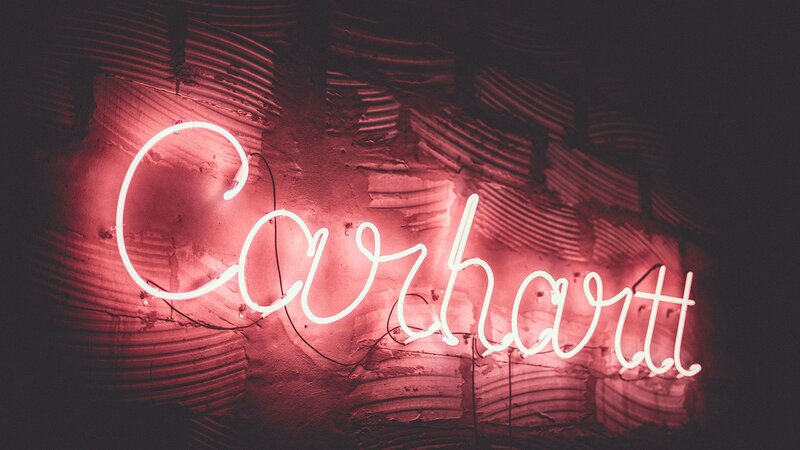 We collaborated with the talented lighting designer, Kob Kor Bor Vor (KOBBORED) who was in charge of all the neon lighting, including the neon Carhartt sign. As WIP is a streetwear brand, we wanted to base the theme on ”Bangkok under construction”. 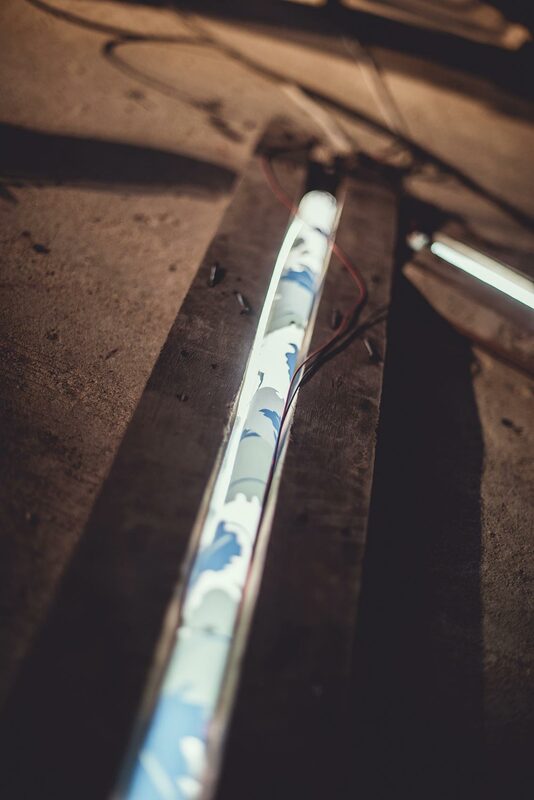 We found an empty unfinished room at Groove that was perfect for recreating a raw industrial experience, using steel scafolding and KOBBORED’s custom neon light designs to transform the space into a construction site. We wanted to embrace the improvised grunge look by hanging the garments on the scafolding last minute and leaving the room unfinished. This matches the spotaneous urban planning of Bangkok streets, and keeps the Carhartt WIP brand visual/style consistant. 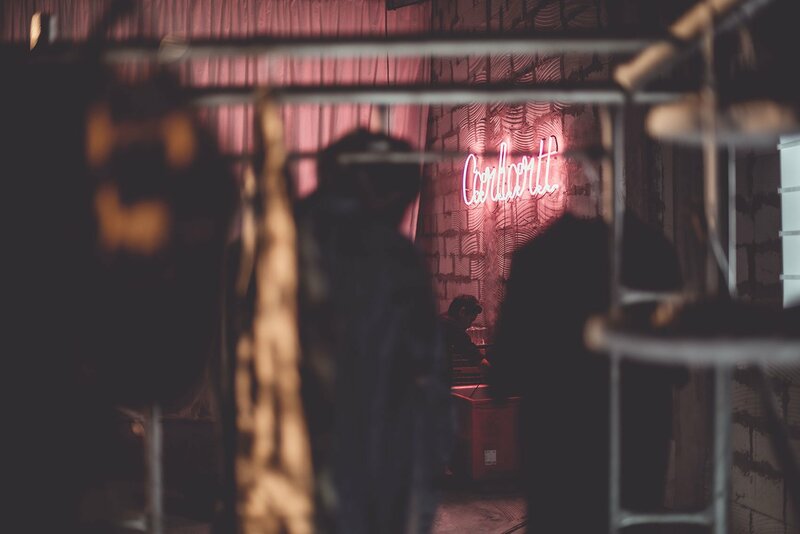 To support Carhartt’s anti-fashion approach, instead of organising a fashion show we got the performers to wear and showcase the garments. This expressed the reality and pureness of the apparel/brand, using the performers to set an example of the Carhartt WIP style and attitude. 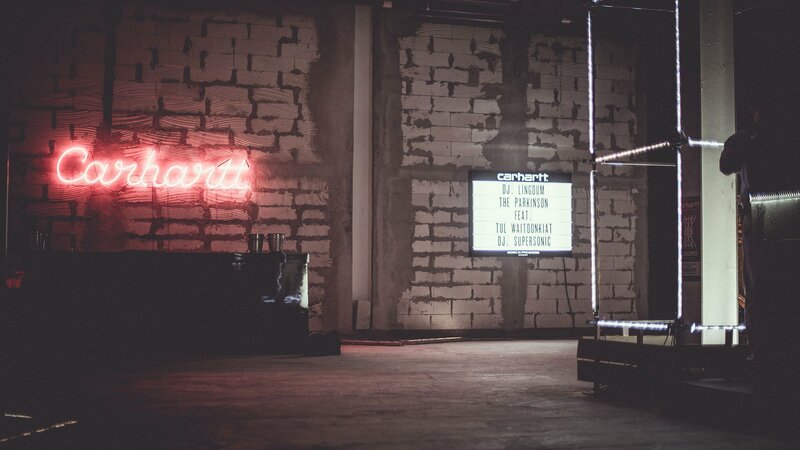 Overall the event was successful and turned into a trendy warehouse party.